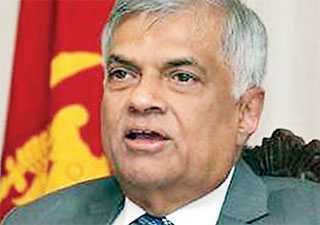 Prime Minister Ranil Wickremesinghe assured the Parliament that his Government will not allow any foreign military to set up camps in the country nor would be allowed to make use of the country to transfer military equipment under any circumstance. Highlighting the commitment Sri Lanka has had signed international treaties to allow transfer of non-military goods at its port the Prime Minister told the Parliament yesterday that the United States need not use Sri Lanka for its military purposes. “The US has large camps in the Indian Ocean island Diego Garcia where the 6th and the 7th fleets of the Navy are harboured. In addition, they have a certain fleet on Bahrain. These vessels are very large, and each vessel carries more than the aircrafts the Sri Lankan Air Force has. With the technological advancements, the US need not have permanent bases in any part of the world. So Sri Lanka will continue to service any Navy for non-military logistic activities,” held the Prime Minister rejecting the opposition charges for allowing the US Navy to use country’s ports for military purposes and increasing the threat on Sri Lanka. According to reports, from 21 – 29 January the US Navy performed a transfer operation to move cargo between planes at Bandaranaike International Airport outside Colombo. This is part of a larger temporary cargo transfer initiative that promotes Sri Lanka’s efforts to become a regional hub for logistics and commerce. The U.S. will pay Rs. 25 million for the said transfers in January. The January transfers are the third iteration of the temporary cargo transfer initiative. It follows two successful transfers that took place in August 2018 at Bandaranaike International Airport and Trincomalee and in December 2018 at Bandaranaike International Airport. Under the initiative, several U.S. Naval aircraft is scheduled to land and depart from the commercial airport, bringing in a variety of non-lethal supplies. The supplies will be transferred between planes and then flown to the U.S.S. John C. Stennis at sea. Supplies may include personal mail for sailors, paper goods, spare parts and tools, and other items. No cargo, military equipment, or personnel associated with this initiative will remain in Sri Lanka after the completion of the cargo transfer. US -Sri Lanka security co-operation encompasses a variety of joint exercises and training that has developed the skills and interoperability of both countries. This cooperation was designed by both countries to address our mutual security interests, such as humanitarian assistance and disaster relief and maritime domain awareness.